Extract the seika3.zip folder that you will find in the “Download” folder on your computer, using the tool integrated in Windows or 7Zip (that you download here) pressing the “Context Menu” key on your keyboard, “7-Zip” submenu, “Extract Here”. Inside the extracted folder you will find “Seika Driver XP_Vista_Win7 V6.3a”. 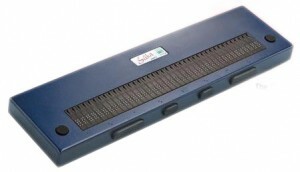 Use this file to install the driver for your Seika braille display. Connect the Seika 3 device via USB and wait few minutes to allow Windows to configure it. Open NVDA menu (Insert+n or CapsLock+n), “Preferences” submenu, “Braille Settings”, and search for “Display Braille Seika” in the dropdown menu called “Braille Display”. Moving down with Tab key you also could set other parameters about the Braille Display. Confirm with OK. Extract the seika.zip folder that you will find in the “Download” folder on your computer, using the tool integrated in Windows or 7Zip (that you download here) pressing the “Context Menu” key on your keyboard, “7-Zip” submenu, “Extract Here”. Extract seikaJaws.zip and install the the Patch for Jaws (32bit or 64bit according to your Operating System). Open Jaws and select “Braille…” in the “Options” menu. Move with Tab to the “Add Braille Display” button and press enter. Select the “Seika” from the list by pressing the space bar. In the next windows set Seika as Primary Device and then complete the configuration with all the default settings.